There is no doubt that electric vehicles are coming, but questions remain if the electric grid can sustain the extra load. Here come the EVs, but are we ready? On the low end, the Electric Power Research Institute estimates their will be 3.1 million electric vehicles on the road by 2020, but without a sound distribution planning system and broader use of renewable resources, like wind and solar, the grid will struggle to meet demand. Staying ahead of this challenge, IBM Research in Zurich is working with Swiss electric utility provider, EKZ on a pilot project using a smartphone app. The web-based app, which also runs on tablets and computers, enables consumers to conveniently charge their electric vehicles using renewable resources, while also monitoring their energy costs. The app, which connects to a cloud provided by IBM, analyzes the amount of energy on the grid, current prices and demand forecasts — it knows on a hot day that their will be a spike in demand. Using this data, the app can offer price points to consumers who can choose, based on price and need, when to charge their vehicle. The app also offers a smart charging feature whereby the user can schedule charges based on the availability of renewable resources, such as sun and wind, allowing the utility to improve load balancing and prevent outages. Since 2009 the the Danish Island of Bornholm has been testing concepts to better balance wind energy with demand on the grid. The first project was called EDISON, in which 50 electric vehicles were installed on the island as storage batteries for excess wind energy on the grid. When the wind blew the cars charged, when the wind died down, the cars provided extra capacity to the grid. Two years later the teams learned a lot and they are have recently received further funding to extend the project into the home in a new project called EcoGrid EU. Unlike EDISON, instead of just using car batteries to balance the load the consortium is using dishwashers, heat pumps and electric water heaters to also store excess energy in 2,000 homes on the island. 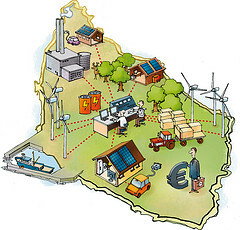 To participate, Danes living on the picturesque island will use smart meters and have access to a Web-based portal, similar to an online auction, where they can schedule when to purchase electricity and at what price. Lykke Friis, the former Minister for Climate and Energy in Denmark, is a strong advocate of the intelligent electricity system. Well known as a birthplace of nanotechnology, Switzerland could easily become the next hub of knowledge about smart grids.